Your move of the black knight by the white King was my second option, studying the board and given that it was black's move. However, why did you not move the knight up and threaten the white queen forcing her away from your king? Never mind, I see that the queen would have taken the knight and you'd be right back where you were. Yes, being 'right back where I started' was not good! 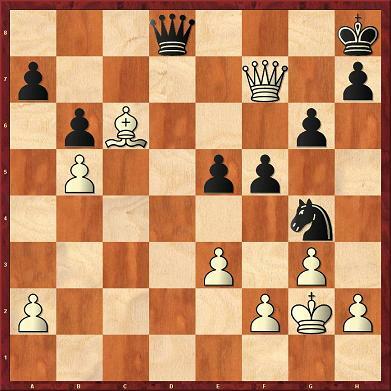 He has a couple of positional pluses (a. Bishop against Knight with pawns on both sides of the board - the Bishop is better at handling these positions as it has a longer 'reach'. b. His queenside pawn are nicely advanced. c. My king is hopelessly exposed), and I so need to force a draw, or I'm a gonna!